[The POWERIVER Advantage]: It contains internal protection mechanisms, and hidden blue LED power indicator to let you know when your charger is working. [5 USB Port] Powerful 8A/ 40W Output: Powerful enough to charge 5 devices simultaneously at full speed with 2.4A max output per port or 8A total current output. [PORTABLE AND SAFE DESIGN] It\'s small and lightweight, ABS+PC material have a wise lame retardancy function, matte surface keeps clean longer, fashionable design, compact and easily portable, perfect for travelling. [HIGH Certified Safe]: Automatic detection output. Over-charge, over-current. Over-pressure. High temperature, short circuit protection, security is guaranteed. 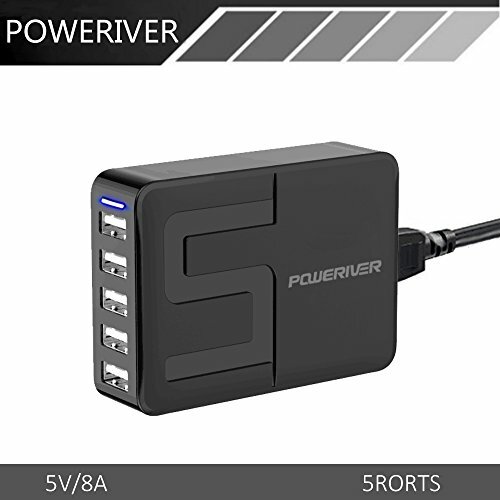 [What you get] Poweriver 40W 5-Port USB Charging Hub, 5ft / 150cm detachable power cord. If you have any questions, don\'t hesitate to contact us!